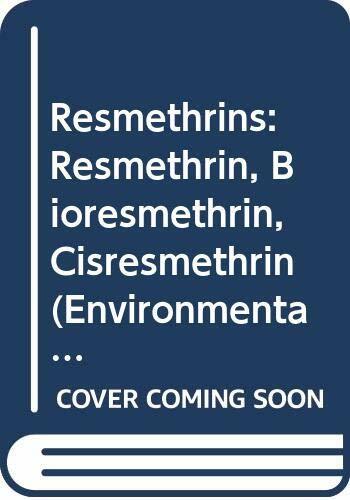 BDU - Resmethrins ::resmethrin, bioresmethrin, cisresmethrin. Resmethrins : resmethrin, bioresmethrin, cisresmethrin. WHO Task Group on Environmental Health Criteria for Allethrins and Resmethrins.United Nations Environment Programme. ; International Labour Organisation. ; World Health Organization. ; International Program on Chemical Safety. Represents the collective views of a WHO Task Group on Environmental Health Criteria for Allethrins and Resmethrins which met in Moscow 16-20 Nov. 1987.; "Published under the joint sponsorship of the United Nations Environment Programme, the International Labour Organisation, and the World Health Organization. "; "IPCS International Programme on Chemical Safety"--Cover. 2 ^aWHO Task Group on Environmental Health Criteria for Allethrins and Resmethrins. ^aGeneva :^bWorld Health Organization ; Albany, NY : WHO Publications Center USA [distributor],^c1989. ^aRepresents the collective views of a WHO Task Group on Environmental Health Criteria for Allethrins and Resmethrins which met in Moscow 16-20 Nov. 1987. ^a"Published under the joint sponsorship of the United Nations Environment Programme, the International Labour Organisation, and the World Health Organization." ^a"IPCS International Programme on Chemical Safety"--Cover. 2 ^aUnited Nations Environment Programme. 2 ^aInternational Program on Chemical Safety.